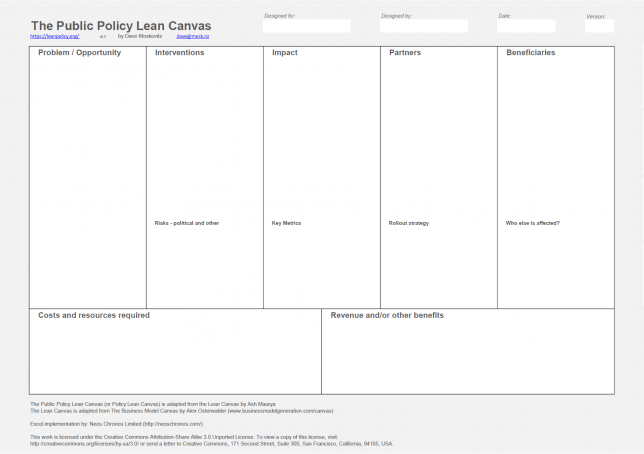 Welcome to leanpolicy.org, home of the Public Policy Lean Canvas and the Government Innovation Manifesto. The Public Policy Lean Canvas, or Lean Policy Canvas for short, is a tool that applies Lean Startup thinking to Public Policy development. It’s an extension of Alex Osterwalder’s Business Model Canvas and Ash Maurya’s Lean Canvas. In a nutshell, Lean is all about expending your effort and resources where they count most in an uncertain world. Rather than going straight to expending millions on a complete solution, the Lean way favours focusing on the problem you’re trying to solve, and identifying and validating basic assumptions before building a solution. Start with a Minimum Viable Policy (MVP), learn what you can from it, and then iterate based on how it actually gets applied by real people. If you’re working in a group, you might like to print out a large poster or three of the PDF version, and then use post-it notes to fill in the boxes; or you may prefer to use the Excel version to fill in the boxes on a large screen or data projector. The key thing is to use the information on the canvas to identify your assumptions about your policy, and then validate them. Hint: you can’t validate these assumptions with other policy analysts or public sector experts, if you really want to learn the truth, you’ll need to “get out of the building” and talk to people who are actually affected by the proposed policy. What is the problem you are trying to solve, or the opportunity you are trying to realise? Try to be as specific as possible. Who would benefit from this policy? How? Who are the other people affected, positively or negatively from the policy? What is the main impact you’re trying to achieve? What are the key metrics to measure that impact? What will success look like? Now that you’ve clearly outlined what the problem is, who has that problem, and the main impact you’re after, we’re ready to outline the policy interventions. How will they work? What are some of the risks associated with the interventions? How will you deliver this policy? Will it be done directly? If you’re using intermediaries, how will you engage them, and how will you get them to engage with the beneficiaries? How will it be rolled out? What are the cost structures associated with the proposed interventions? Are there non-financial costs that need to be considered? Will the interventions generate revenue? For whom? Are there other non-financial benefits? Remember, to whatever extent you can, keep it really simple. The canvas is mainly meant as a tool to help you identify assumptions you’ll need to construct experiments to validate. You’ll have plenty of time for traditional policy development later – but you’ll be able to do so with a much better understanding of the landscape, and with much greater confidence that your efforts are going to make a difference to the people you’re most concerned about. While you’re here, check out the Government Innovation Manifesto. The Public Policy Lean Canvas was created by Dave Moskovitz. Do you have any comments or suggestions? Please let me know.